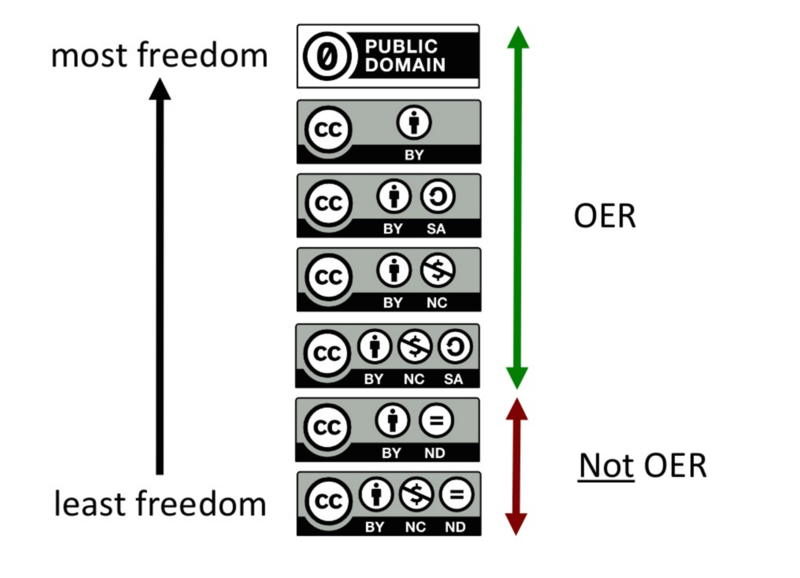 A defining part of Open Educational Resources (OER) is that the materials either exist in the public domain or have been released under a license that permits reuse and adaptation. Not all free resources are actually OER and it is important to be aware of this distinction as you consider how you want to create, reuse, and adapt educational resources. Creative Commons licenses are the most frequently used for open resources. These licenses make it easy to highlight how others may use resources you create. For more details about Creative Commons licensing, see licensing considerations. Creative Commons licenses are free and no registration is required to use a license with your work. Choose your license here! These licenses come in come in a variety of options, depending on the permissions creators want to retain or grant others.